The Living Field project will be exploring in 2018 the history, methods and value of diversifying crops and cropland. 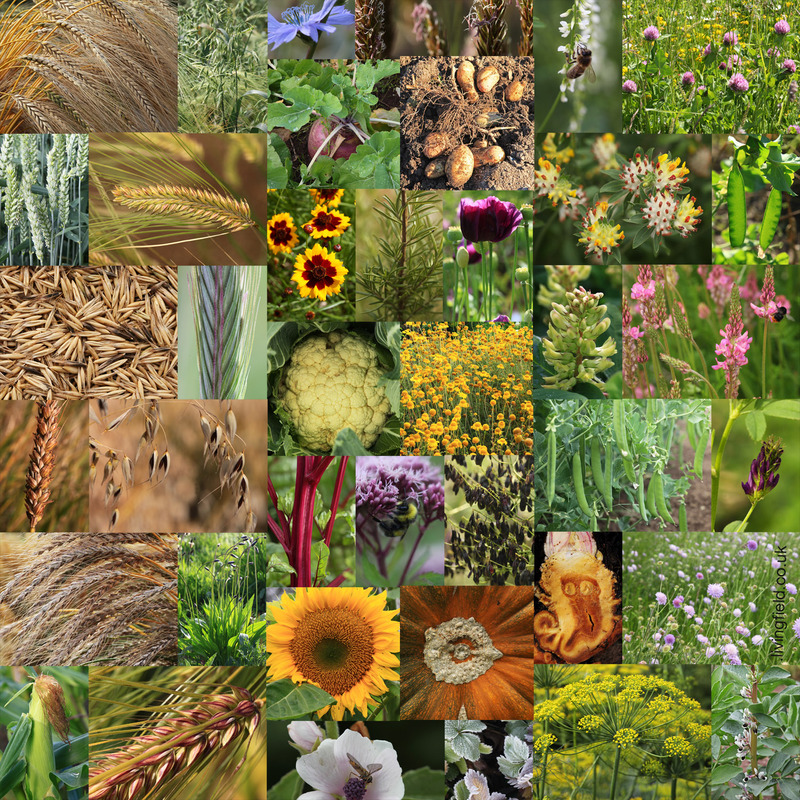 An Introduction is given on the Living Field’s web site at Crop diversification which explains why diversification matters, what it does for the sustainability of an ecosystem, its general decline in cropland and possibilities of restoring it. The Living Field articles will run in parallel to accounts of diversification on the Hutton Institute’s farms. A wide range of crops and other useful domesticated and wild plants have been grown in the Living Field garden over the past 15 years. Starting with the cereals, for example, the Garden has grown emmer wheat, one of the first crops to be domesticated in the fertile crescent, and also spelt and bread wheats. Cereal or corn crops also include barley, both old landraces and modern varieties, oat, rye and maize. Rice and millet were tried but did not appreciate the temperature. Cereals are shown to the left on the collage below, reproduced from the Living Field web site. Other main groups include grain and forage legumes, medicinals and herbs, dye plants, tubers and vegetables. Micro-habitats have also been created and maintained – wet ditch and small pond, hedges and trees, meadow. Each supports a specific flora. Because of limits to space, not everything can be grown in all years, but in any summer, typically 200 plant species can be found. The garden is profiled on the Living Field’s web site at garden/living-exhibits.